This prospective observation study was conducted in the emergency intensive care unit (EICU) over an 18-month period from January 2007 to June 2008. Chest ultrasound was performed in 81 multiple trauma patients with mechanical ventilation. Computed tomography (CT) was regarded as the “golden standard” to diagnose lung atelectasis/consolidation. Computed tomography detected 154 lung atelectasis/consolidation in 324 lung regions in 81 patients. Ultrasound confirmed 126 lung atelectasis/consolidation, 87 with complete and 39 with incomplete atelectasis/consolidation. The sensitivity, specificity, positive predictive value, negative predictive value and accuracy of ultrasound were 81.8, 100, 100, 85.9 and 91.4%, respectively. A Kappa agreement test showed a very high concordance between ultrasound and CT with a Kappa coefficient of 0.825 (P = 0.031). The effective ratio of ultrasound guiding lung recruitment was 80.2%. 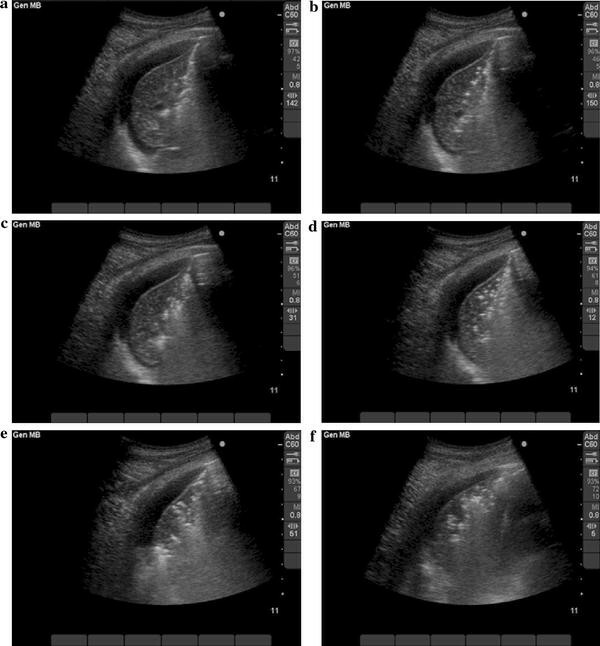 Ultrasound is a safe, dynamic viewing and accurate method to diagnose and manage lung atelectasis/consolidation in multiple trauma patients with mechanical ventilation. Lung atelectasis and consolidation are common situations in mechanically ventilated patients in intensive care unit (ICU), and may result in impaired lung oxygenation, prolonged ventilation and increased mortality. Daily assessment of the lungs is an important issue in caring these patients. The traditional procedure for lung assessment is chest radiography, which has been used for more than one century and can be used at bedside, but is less accurate and sometimes may be misleading . Computed tomography (CT) can provide the most precise information of the whole lung and is regarded as the “gold standard”. But in most settings, it cannot be available at the bedside and need to transfer the critically ill patients to CT room, and that may be potentially dangerous . Ultrasonography is an accurate, portable, noninvasive and irradiative-free diagnostic tool, and is especially useful for critical illness. It has been widely used in the early evaluation of severe trauma patients, which is known as focused assessment with sonography for trauma (FAST) [3, 4]. Recent studies showed bedside ultrasound had a good capacity to detect lung atelectasis/consolidation in critically ill patients [5, 6]. However, there is no study on its applications to detect lung atelectasis/consolidation in multiple trauma patients with mechanical ventilation. This prospective observation study was conducted in the emergency intensive care unit (EICU) over an 18-month period from January 2007 to June 2008. 81 consecutive multiple trauma patients were investigated, 66 were male and 15 were female. The average age was 47 ± 17 years. 52 cases had direct chest trauma. All patients were mechanically ventilated and received chest CT scans at clinical needs. Chest ultrasound was performed within 10 min before or after CT scan at the bedside by three intensivists (authors JXY, MZ and ZHL), who were experienced in critical ultrasound and were unaware of CT findings. The protocol was approved by the Ethical Committee of the hospital and an informed consent was considered not necessary. CT was performed from the apex to the diaphragm with a 16-slice Siemens Volume Zoom CT Scanner (Siemens Co., German). Lung atelectasis/consolidation was defined as a tissue-like pattern visible at the mediastinal window. A portable ultrasound device (MicroMaxx, Sonosite Co., America) with a 3.5-MHz convex probe was used to diagnose lung atelectasis/consolidation. Patients were kept in supine position and a thorough examination of anterior, lateral and posterior thoraces was performed. The following characteristic signs were required to define lung atelectasis/consolidation (Fig. 1): tissue-like pattern reminiscent of the liver located at the thoracic level, which is arising from the pleural line, and has a caudal inspiratory movement during the breathing cycle . We divided the whole lung into four regions: right upper lung (including right upper lobe and median lobe), right lower lung, left upper lung and left lower lung. The volume of lung atelectasis/consolidation was arbitrarily separated into small (maximal thickness <50 mm) and massive (≥50 mm) . According to the changes of ultrasonic pattern during breathing cycle, lung atelectasis/consolidation was distinguished to a complete or incomplete one (Fig. 1). Statistics analysis was performed with SPSS 17.0 software for windows (SPSS Inc., Chicago, IL, USA). Data were expressed as number and ratio. The diagnostic sensitivity, specificity, positive predictive value, negative predictive value and accuracy for ultrasound were calculated and compared by Chi-square test or Fisher’s exact test. The performance of ultrasound for detection of lung atelectasis/consolidation was compared with that of CT using Kappa agreement test. A P value less than 0.05 was considered as statistically significant. Efficacy of chest ultrasound in the diagnosis of lung atelectasis/consolidation comparing to CT. CT detected 154 lung atelectasis/consolidation in 324 lung regions in 81 patients, 91 of which were massive and 63 were small. 117 (76%) were occurred in bilateral lower lobes. Ultrasound confirmed 126 lung atelectasis/consolidation, 87 with complete and 39 with incomplete atelectasis/consolidation. The sensitivity, specificity, positive predictive value, negative predictive value and accuracy of ultrasound were 81.8, 100, 100, 85.9 and 91.4%, respectively. A Kappa agreement test showed a very high concordance between ultrasound and CT with a Kappa coefficient of 0.825 (P = 0.031) (Table 1). Further analysis showed that ultrasound was as effective as CT in diagnosing lung atelectasis/consolidation in lower lungs (χ2 = 2.405, P = 0.121), but not in upper lungs (χ2 = 4.663, P = 0.031) (Table 2). Clinical interventions according to CT and ultrasound findings. Once lung atelectasis/consolidation was detected by CT and confirmed by ultrasound, we tried to recruit the lungs with interventions including changing body position, endotracheal suction, recruitment maneuver, increasing PEEP, pleural effusion draining and fibrescope examination. Ultrasound was used to dynamically evaluate the efficacy of lung recruitment (Fig. 2). Ultrasound showed 39 lung regions with incomplete atelectasis/consolidation were completely recruited and 62 of 87 lung regions with complete atelectasis/consolidation gained significant recruitment in the following 3 days. The total effective ratio of ultrasound guiding lung recruitment was 80.2%. Time and safety. The ultrasound device is a regular equipment of EICU and is available at any time. A valuable result can be acquired within 4–6 min. No severe complication was observed related to ultrasonography. Lung atelectasis and consolidation are different in pathophysiology but similar in image, and CT is regarded as the “gold standard” for diagnosis . In this study, we demonstrated bedside ultrasound had a good accuracy (91.4%) in the diagnosis of lung atelectasis/consolidation. There was a very high concordance between ultrasound and CT (Kappa coefficient = 0.825, P = 0.031). However, the value of ultrasound in upper lungs was not as effective as in lower lungs when compared to CT. Ultrasound confirmed 104 of 117 CT diagnostic lung atelectasis/consolidations in lower lungs, while only 22 of 37 in upper lungs were detected. Fortunately, we found that most of lung atelectasis/consolidations occurred in bilateral lower lobes (76.0%), so ultrasound could be clinically helpful. Ultrasound can be performed by clinicians and provide real-time monitor of the lungs at the bedside. 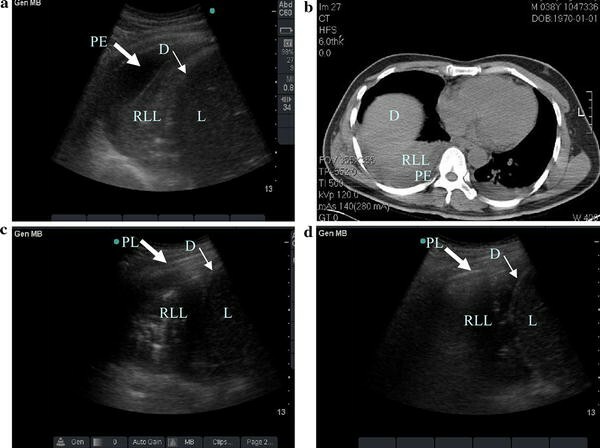 Lung atelectasis/consolidation can be distinguished to a complete or incomplete one by ultrasound, and that may be of important value in the management of patients. In this study, 101 of 126 ultrasound diagnostic lung atelectasis/consolidations were recruited in the following 3 days, dynamically monitored by ultrasound. The total effective ratio of ultrasound guiding lung recruitment was 80.2%. The efficacy of lung recruitment in patients with incomplete atelectasis/consolidation was better than that with complete atelectasis/consolidation (100 vs. 71.2%). Limitations of ultrasound should also be considered. In trauma patients, pneumothorax, parietal emphysema and dressings can prevent analysis. Ultrasound may also miss small consolidations or consolidations in the central of lungs in some cases. Skilled investigators are needed to achieve better sensitivity and accuracy. In conclusion, ultrasound is a safe, dynamic viewing and accurate method to diagnose and manage lung atelectasis/consolidation in multiple trauma patients with mechanical ventilation.